Below my introduction is an article further revealing the false teachings of Bill Johnson of Bethel Church in Redding, California in a new book that he has contributed to, “The Physics of Heaven”. This influential cult, part of the larger “New Apostolic Reformation” movement, spreads poisonous false doctrine like a disease throughout the world. Bill Johnson is a regular speaker at conferences and ‘churches’ in Australia, including Hillsong Sydney and C3 (Christian City Churches). There are many other Anglican, Baptist and independent churches who have also embraced the false teachings of the ‘New Apostolic Reformation’ movement in which Johnson is an ‘apostle’. I, like many other brothers and sisters in Christ around the world, have seen firsthand the devastation that these destructive heresies and deceiving spirits have on pastors and congregations. Given that title with claims on the church website that Bethel has a “global impact as a revival resource and equipping center,”2 it is expedient and responsible to examine Johnson and determine if he is indeed an apostle sent from God to the body of Christ. The Physics of Heaven, a recent book Bill Johnson contributed to, and his personal assistant co-authored, reveals a very different picture than that of the apostles described in the Bible. It appears that rather than an apostle of God, Bill Johnson may be poised to serve as the vehicle that carries the New Age and quantum spirituality deep into the Body of Christ. Stop and think about what is being said here: “the tools that God has given us” somehow ended up in the New Age? How did that happen? And which tools is he talking about? Why would a professing Christian say something like this? New Age teaching is in total opposition to the Word of God. To suggest that New Age practices are really just hijacked Christian truths is utterly absurd. Bill Johnson and Bethel Church exert significant influence in the body of Christ. And whatever path Bethel and its leaders travel is the path on which many will follow. We need to pay attention to what is happening here, using discernment and godly wisdom. While Bill Johnson’s approach to prayer and worship and the extreme emphasis placed on signs and wonders has concerned many, it is the 2012 book titled The Physics of Heaven (in which Johnson is one of eleven contributors) that indicates the real direction Johnson and Bethel are heading. In addition to Johnson’s own contribution to the book (one full chapter), his personal assistant, Judy Franklin, is a co-author; and the foreword of The Physics of Heaven is written by Kris Vallotton, Senior Associate leader at Bethel. Vallotton lauds the contributors as “seers.”5 Banning Liebscher, Director of Bethel’s Jesus Culture, adds his praise.6 Bill Johnson’s wife, Beni Johnson, also has a chapter in the book. With all that, The Physics of Heaven undeniably has the approval of Bethel’s leaders. So what does The Physics of Heaven reveal? The Next Move of God? This is like taking a bottle with a “Poison!” warning on it and re-labeling it, “Honey.” Contemplative prayer, which is essentially Eastern/New Age meditation disguised with Christian terminology, entered the church in just this manner. The action taken by these bold new believers caused the Gospel to spread. Lacking basic discernment about involvement with the New Age, co-author Davis, the Bethel Redding contingent, and the other contributors have rendered a great disservice to the Body of Christ. The Bethel contributors, in particular, can potentially do the most damage because of their popularity and high visibility. This is dangerous thinking. The Bible is our map. To go “beyond what we know” is to go beyond the parameters of Scripture. The Physics of Heaven, whether intentionally or unintentionally, serves to illustrate how the false church will form—or, more accurately, how it is forming. New Age practices will increasingly be welcomed into the Body of Christ. These practices will be presented as redeemed or Christian in origin. The church will be subverted—turned toward Eastern/New Age/Quantum mysticism. Language, terms, and trappings may even remain essentially “Christian”—but acceptance of the biblical Christ will diminish. A Bridge to the New Age? Bill Johnson has an interesting teaching about Christ that can be seen as a bridge between the two belief systems—New Age and biblical Christianity. In other words, Bill Johnson believes the miracles Jesus performed came about because He, as a man, and only as a man, had access to the power of the Holy Spirit. Therefore, Johnson teaches that Christians should be capable of wondrous feats of healing and miracles due to our own relationship with the Holy Spirit. Kenosis comes from a faulty understanding of Philippians 2:7. It is proven false by the simple fact that Christ not only created the universe, but He holds it together. If Christ had given up His divine power and attributes and had operated only as a man until Resurrection, all creation would have come apart! (Colossians 1:17). Furthermore, when Jesus said, “Verily, verily, I say unto you, Before Abraham was, I am” (John 8:58), He was making an emphatic statement to a claim to be both God and man—present tense! In 2014, Johnson attended the Empowered 21 Conference, a gathering of Christians who are certain a “Second Pentecost” is coming by 2033.17 Through the influence of Bethel Church, the “apostles” of the New Apostolic Reformation, and others, a large portion of the church now believes there is a coming supernatural end-time event, an outpouring of great power. Most in this camp are dominionists. Their understanding is that Adam and Eve lost dominion of the earth to Satan, the resurrected Christ appointed the Church to take it back, and Christ either cannot or will not return until the Church has accomplished its task. If you have never found this theology in the Bible, it is because it is not there. That the contributors believe those in the New Age may understand the manner in which an alleged “next move of God” might occur is chilling. Is it a coincidence that New Age leader Barbara Marx Hubbard also predicts a coming spiritual shift of great significance? The false “christ” who communicated with Hubbard for decades revealed this Planetary Pentecost will instantly transform most humans (but not Christians and others who do not believe God is in everyone) into a spiritually evolved race. What if the “next move of God”31 that The Physics of Heaven expects and the New Age “Planetary Pentecost” are the same event? Could it be that they are waiting for the same “christ” to perform this “vibrational” shift in humanity? Is this possible? Could this be the unholy deception we have been warned about in the Bible? Some may be asking, what would cause an evangelical church to become receptive to New Age ideas and concepts? For Johnson and Bethel, as with so many Christian leaders and churches today, contemplative prayer has played a significant role in “conditioning” the people at Bethel to head in the New Age direction. There is much irony in suggesting, “[E]very time a counterfeit shows up, take it as the Lord presenting you with an opportunity to reclaim . . . the Church’s stolen property,”33 since this is how contemplative prayer snaked its way into the body of Christ in the first place. Contemplative adherents, such as Richard Foster, have convinced Christians that Eastern and New Age meditation are actually counterfeits of the real deal (i.e., contemplative prayer). Contemplative prayer is presented as an ancient Christian tradition. Yet, contemplative prayer is not prayer at all. It is essentially Eastern/New Age meditation thinly coated with Christian terminology. The goal in contemplative prayer is to stop the thinking process and to enter what is known as the silence. This is accomplished by repeating a word or phrase over and over (or focusing on the breath) until the word loses its meaning and the mind becomes void. In this void—this silence—many wonderful deceptions can occur: spirit guides, ascendant masters, oneness, bliss, false “christs.” The deception that occurs through contemplative prayer destroys doctrinal soundness and ultimately even faith. In comparison, when we are truly “meditating” on God’s Word, the mind remains active, and we ponder upon or think about the Word of God. Never do we try to cease active thought in order to empty our mind or as Ray Yungen says putting our mind into “neutral”34 so that God can supposedly fill it. Johnson seemingly warns about emptying the mind and then directs how to accomplish that very thing! Contemplative prayer has also been taught in a classroom setting at Bethel. This Prayer House is not described as a place for Bible study, or for supplication or devotions. It is intended to facilitate contemplative prayer, and contemplative prayer has, in turn, facilitated entrance into the New Age. Quantum spirituality or quantum mysticism is a spiritual interpretation, one might say, of quantum physics. New Age proponents embrace it because they feel it gives validity to their belief not only that all is interconnected energy, but that all is God. Thus we are all One. Everything is interconnected. Of course, if this were true, there would be no need for the Cross as a means of salvation for mankind. In The Physics of Heaven, it says that God’s “voice [is] filling every atom in the universe.”50 This is a kind of disguised view of panentheism and is what New Age teaches. For example, Matthew Fox, quoting Pierre Teilhard de Chardin, says that God is in “the tiniest atom.”51 New Agers teach that through quantum spirituality, man will realize his own divinity and will see that he embodies the “cosmic christ” (a christ-consciousness). God is not an impersonal energy force, and people are not “God” as part of this energy force. Quantum mysticism and the New Age are in total opposition to the Bible. Whether Bill Johnson and other Bethel Redding leaders realize the ramifications of their actions or not, their participation in and approval of The Physics of Heaven begs the question: Does Bethel threaten to serve as a spearhead for synthesis of the sorcery-science of New Age/quantum mysticism into the Body of Christ? 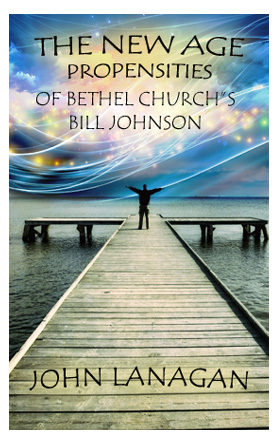 To order copies of The New Age Propensities of Bethel Church’s Bill Johnson, click here. Author Bio: John Lanagan is a researcher and writer. He writes about issues that are affecting believers and turning them away from the truth of God’s Word. You can read more of his work on his blog at: http://mywordlikefire.com. He resides with his wife in the Great Northwest. 1. Ellyn Davis, The Physics of Heaven (Crossville, TN: Double Portion Publishing, Kindle Edition, 2013), Kindle location: 405. 2. Bethel Redding website, http://bethelredding.com/about. 3. Bill Johnson, Dreaming With God: Secrets to Redesigning Your World Through God’s Creative Flow (Shippensburg, PA: Destiny Image, 2006), p. 86. 4. Ray Yungen, For Many Shall Come In My Name (Eureka, MT: Lighthouse Trails Publishing, 2007), p. 17. 5. Kris Vallotton, The Physics of Heaven, op. cit., Kindle location: 96. 6. Ibid., Banning Liebscher, Kindle location: 85. 7. Ibid., Ellyn Davis, Kindle location: 447. 8. Ibid., Jonathan Welton, Kindle location: 808. 10. Ibid., Ellyn Davis, Kindle location: 392. 12. Bill Johnson, When Heaven Invades Earth: A Practical Guide to a Life of Miracles (Shippensburg, PA., Destiny Image Publishers Inc., 2003, Kindle edition), p. 1113. 13. Kenosis, Christology, and Bill Johnson, Crosswise Blog, http://notunlikelee.wordpress.com/2011/06/16/kenosis-christology-and-bill-johnson-part-ii. 14. Bill Johnson, When Heaven Invades Earth: A Practical Guide to a Life of Miracles, op. cit., Kindle location: 259. 15. Bob Dewaay, “An Invasion of Error” (Critical Issues Commentary, Issue 124 Jan.-Feb. 2013, http://www.cicministry.org/commentary/issue124.htm). 16. Bill Johnson, The Supernatural Power of a Transformed Mind: Access to a Life of Miracles (Shippensburg, PA: Destiny Image Publishers Inc., 2005, Kindle edition), Kindle location: 1959. 17. Chris Mitchell, “Spirit-Empowered Believers Praying For Second Pentecostal Outpouring” (Charisma, 4/1/14, http: empowered21.com/about). 18. Judy Franklin, The Physics of Heaven, op.cit., Kindle location: 202. 19. Ibid., Kindle location: 203. 20. Dr. Orrel Steinkamp, “Assessing Current Teachings, Issues, And Events With Scripture: A Second Pentecost?” (http://www.deceptioninthechurch.com/secondpentecost.html). 21. Judy Franklin, The Physics of Heaven, op. cit., Kindle location: 188. 22. Ibid., Bob Jones, Kindle location: 522. 23. Ibid., Ray Hughes, Kindle location: 1125. 24. Ibid., Ellyn Davis, Judy Franklin, Kindle location: 471. 25. Ibid., Bob Jones, Kindle location: 534. 26. Ibid., Ellyn Davis, Kindle location: 860. 27. Ibid., Ellyn Davis, Judy Franklin, Kindle location: 470. 28. Alice Bailey & Djwhal Khul, “The Labors of Hercules—Labor XII,” Lecture by A.A.B.—1936, (Caux, Switzerland: Netnews Association and/or its suppliers, 2002), http://www.netnews.org, http://laluni.helloyou.ws/netnews/bk/hercules/herc1062.html. 29. “Barbara Marx Hubbard and the Armageddon Alternative” Brooks Alexander, SPC Vol. 19:2/3, 1995, p. 49. 31. The Physics of Heaven, op. cit., Kindle location: 447, 1462. 32. Warren B. Smith, False Christ Coming: Does Anybody Care? (Eureka, MT: Lighthouse Trails Publishing, 2010), pp. 119-120. 33. Jonathan Welton, The Physics of Heaven, op. cit., Kindle location: 808. 34. Ray Yungen, For Many Shall Come in My Name, op. cit., p. 19. 35. Compiled by Beni Johnson, Prayer Changes Things: Taking Your Prayer Life To The Next Level (Shippensburg, PA: Destiny Image Publishers, 2012), p. 51. 38. Roger Oakland, Faith Undone (Eureka, MT: Lighthouse Trails Publishing, 2007), p. 119. 39. Beni Johnson, Prayer Changes Things: Taking Your Prayer Life To The Next Level, op. cit., p. 65. 42. The Secret Place, class, Bonnie Johnson http://bethelredding.com/get-involved/classes/secret-place. 46. Ellyn Davis, The Physics of Heaven, op. cit., Kindle location: 1742. 47. Ibid., Judy Franklin, Kindle location: 317. 48. Ibid., Kindle location: 1825. 49. Warren B. Smith, A “Wonderful” Deception (Magalia, CA: Mountain Stream Press, 2009), p. 167. 50. Larry Randolph, The Physics of Heaven, op. cit., Kindle Location: 1425. 51. Matthew Fox, The Coming of the Cosmic Christ,(San Francisco, CA: Harper & Row Publishers, 1988), p. 129. 52. Annette Capps, Quantum Faith (England, AR: Capps Publishing, 2003, 2007), p. 6.
thank you John L for this very informative article… boy we need to pray like never before! Throughout my 30+ years of ministry throughout the world, I would have to say that jealousy between Christians has been the most prominent sin I’ve witnessed. When have I ever read about some obscure personality who is being criticized. Criticism comes when one is jealous of that person who is doing or believing something “different” from the norm. Christ tells us that they (the world) will know us by our love, not by our doctrine nor by our contentions. Some of the people who have contentions with me will live near me in Heaven and there will be no criticism nor fighting! Thank you for sharing your reflections from your experience in ministry. I am not sure whether your comment is a defense of Bill Johnson or just a general observation you are sharing, and whether it is directed at me or the author of this article. Perhaps you could clarify? Sadly, Bill Johnson is not an obscure personality. He is a rank heretic who claims to be a Christian, and whose false teachings are tearing apart congregations and families all around the world. Please be assured, I am not jealous of Bill Johnson (I am quite sure the Lighthouse Trails team isn’t either). On the contrary, I and many other Christian writers and pastors featured here at The Narrowing Path are actively warning other Christians to stay away from his dangerous false teaching and unholy manifestations. He is hardly someone to be envied. I am curious as to how you came to believe this statement. It is nowhere taught in Scripture, and having done a psychology degree, I can assure you it is nowhere taught in humanistic psychology either. I have many, many friends who do and believe things that are different from the norm. It has never occurred to me to be jealous of them for that, or for any other reason. However, it is certainly my observation that criticism will regularly manifest when people see cults destroying people’s lives, or when Christians see God being blasphemed. And so it should. Jesus was very clear about his high view of sound doctrine (hardly surprising since it is his Word), and also his views on false doctrine and false shepherds. So was Paul. And Peter. And John. It is loving to warn people about damnable heresies. It is loving to share the Word of God and warn the flock about wolves. It is loving to warn people about dangerous cults. It isn’t jealousy. The authors featured here at TNP are Christians who love God’s Word and his sheep, and I thank God for them every day. Personally, if I was going to be jealous it would be of these godly men and women, their genuine relationship with the Lord, and their wonderful grasp of sound doctrine. But truly, how could I begrudge them that? I hope that you can spend some time here reading the many other excellent articles and listening to the sermons shared here at TNP. I’m truly trying to read this and understand what facts support your position. Why didn’t you use scripture comprehensively to prove your position? In one sentence you say something is utterly absurd..why then? Why didn’t you use the bible holistically support that opinion or any of your other criticisms and warnings. I sincerely want to be warned in such scary times, but sadly your article is just too emotional and barely factual. Far too subjective. Thanks for the feedback. The brief article is written and published as a tract by a Lighthouse Trails author. I post it here as a warning, always in the hope that people will take note and do further research. For detailed commentary on Bill Johnson’s false teachings, you may find the articles from the Crosswise blog (notunlikelee@wordpress.com) most helpful. I have posted a number of them here under the NAR tab, or you can find them by searching ‘Bill Johnson’. I just watched Darren Wilson’s “Finger of God” with a couple of friends two nights ago, one of whom is an incredibly Christian intellectual, and the other frankly a devout apologist. I was blown away, and so were they. We even tried praying for one of my friends like people in the movie were praying for the sick. In the time since then, I’ve begun to investigate Bill Johnson, because i was close to moving out there. It’s a powerful movie … but I don’t make moves without doing inspections first. So, after that, i began looking for an essay that could present something logically, Biblically, and awesomely. Thank you for being that writer. your paper is a lighthouse of an essay. Unfortunately, I’m now realizing I have been kind of wrong about this whole miracle stuff. God does what he does. Praying for my friend like those people prayed is still relying on formulas, however casual the formula appears. Personally, I have been chasing the supernatural, hunting for those kinds of otherworldly experiences with God, for a little while. It’s been the most interesting thing in life, that there is a supernatural realm, that God actually exists, and that he cares about me. Thanks to your essay, I can see that I’d been starting to walk a twisted path instead of just following what the Holy Spirit is simply showing me what is next in my life. I’ve been kind of sensationalist. Thanks again for your great paper. Don’t worry about the other folks here either hissing emotional reasoning, or insulting your lack of Biblical citation. You say enough. Itching ears will disregard you anyway. Keep writing. Words can hardly describe how encouraged I am by your testimony, and your kind words. The article you commented on was written by an editor at Lighthouse Trails, so I can’t take credit for it. However, I am so glad it was helpful to you! God is so gracious and merciful, to open your eyes to the blasphemous lies being passed off as his glorious truth. Imagine…we have eternity to express our thanks to him for bringing us from darkness into light, from death to new life- and some days I wonder if that will be long enough. Thankfully, God forgives us when we repent, and repent I did when my eyes were opened. You can also read my Baptism testimony in the June 2013 archives, if you wish. I hope these articles are helpful to you. I am so thankful to God that you can see the dangers of this false NAR movement. There are a lot of great resources here at The Narrowing Path that you may find useful, that further address these wolves. May I also commend to you the excellent sermons available in the ‘Sermon & Song Link’ tab. They are all meat from the Word of God, and are nourishing food for our weary souls! I pray that God will continue to bless you in your pursuit of his truth, and in your service to the Lord Jesus Christ. Feel free to comment on or further discuss any of the articles or sermons here. wow, thank you for your informative reply. i will check out those things. right off the bat, that title of filming the holy spirit, it reminded me how bothered i initially was about there being miracles, and then about people calling each other up to the mic to talk about them. i don’t mind that stuff if it’s real, but just making a big deal about it seemed to me a little weird. i’m shy though. the hard part in my life has been just simply following what Christ shows me through the holy spirit. it’s not actually hard, it’s right. and i’ve been sinning in not seeing it, in chasing excitement instead. i hope that people with discernment will continue to expose frauds. it really disturbed me when I began reading how much New Age stuff is in Johnson’s church. i mean, it really disturbed me. nauseatingly. When i hit ‘kenosis’ i knew i had to reject it all. not that those healings weren’t real. I think that God works in mysterious ways, and heals all kinds of things. maybe it’s the innocence of the asker, not the arrogance of the ‘healer’. There is only one healer. I have to detox myself from a lot of New Age ideas that I’ve kind of picked up in the past few years. It’s everywhere. It’s all over me now. I ask you to pray for me, that God will guide me into his truths and keep me on this path, that while it looks narrower from the outside, it’s actually quite the same width if i don’t get distracted by all the nonsense around me! thanks again, and i’ll comment on those things when i watch/read them. all the best. The new age/esoteric aspects of the NAR and WOF stuff are very concerning…especially the clear connections to theosophical teachings and ‘prophecy’. I am glad you have a handle on that aspect of it. Creepy and dangerous gnostic lies! I am thankful for my friend Craig from the Crosswise blog who did such fine work on many of the more in depth the articles posted here about Bill Johnson. One of the saddest things I realised about this false movement, is that it actually blinds people from seeing the awesome miracles of salvation, sanctification, the illumination of the Scriptures, and gracious provision that God gives his people through his Holy Spirit – every day. It is these ‘miracles’ that deliver us from darkness in to light, from death to new life, and then strengthen and sustain us in our in faith in God our Father and the Lord Jesus Christ! Sadly, we have all imbibed from the new age well over the decades, often not knowing it or thinking it is harmless. And you are right, it is flat out sinful. I know I did this for many years in my spiritual blindness and sin…and I agree, it takes time to shed it all. I also have to keep teaching my kids discernment about it, as it has completely taken over national school curriculum in the West. I found reading and studying the Old Testament (plus many good sermons) very helpful, and was so convicted when I realised that it was the same sinfulness of ancient Israel. Mixing true religion with false. They committed ‘spiritual adultery’ with the pagans and in the end turned from God and were judged for it. The visible church has done the same over the centuries, and we are all individually guilty. How humbling it is to realise that we are no more righteous than the Israelites of the Old Testament! As for staying on the narrow path, there are many things that help this…reading the Bible, talking to God in prayer, listening to faithfully exegeted sermons until you know the Scriptures through and through, and staying in touch with other Christians seem to be the most important. However, in the end, we can trust God’s promise that He will complete the good work he has begun in us. We are new creations in Christ, adopted children of God…how awesome to contemplate! Be strong in the Lord. He will keep you safe until you see him face to face! I am not sure what video you saw with Heidi Baker imparting a demon into a child but let me tell you what I have seen the past few years since I started praying for people to get free from different things. A lot of time, maybe 99% when we first come together to pray and I touch their shoulder or even say something as general as Father God, we have come here to ask for Your help…the people starting manifesting really badly- jerking, screaming, name it- and I have asked God to show me why is that happening and I think it;s because the demons recognize our authority and they are scared, just as demons begged Jesus to not expose them in the Bible, because we carry Jesus with us as our personal savior, when a person is under the influence of anything demonic- they manifest- they come to the surface, name it however you’d like. So I have learned to just command the demon to stop manifesting because it’s not helping the person, it’s must be really scary for the person and it makes it harder for us who are praying. So I just tell them to shut up and stop manifesting and then we pray for freedom and for the person to be filled with Holy Spirit and to receive Jesus in their lives. Maybe that’s what happened in that video? I don’t know what to say, but thought to share my experience so far because we are all called to pray freedom for the captives and the oppressed and chances are that you will be confronted with this in your future. In Isaiah 55:8 “Your ways are not MY ways”…and then again in Isaiah 64:6 “But we are all like an unclean thing…” ” there is no one who does good, no not one…” There is only One God, we are His creation, to praise and honor Him for ever. Thank you for your article it is helping me clarify a dream I had about Bethel. I dare say “prophetic” but in a sense it was. I live in Redding, and I had thus dream about Bethel before I even knew it existed. I have never forgotten it and have been pondering its meaning for years. It was a real kinda “De ja vu” dream but not quite like it. The dream did not bode well for Bethel and I am wondering if I should even bother telling them about it. Maybe it was God just warning me about that place. Anyway very informing it was and I would have to explain more for you to fully understand. But again this was eye-opening and you are on the right path…I KNOW you are..Lords blessings to you. If he is New Age, he never would have voted for Trump. Bethel Redding is hardly and evangelical church if evangelical churches hold to the sufficiency of Scripture. Bill Johnson is into extra biblical revelation, and in a big way. Indeed, it is a misnomer when compared to the way in which the term ‘evangelical’ is used within Biblical Christianity. It seems the term is now used so generically as to have lost its meaning. Of course, Bethelites would probably argue that they are evangelical and are spreading the ‘gospel of the kingdom, which they think is good news. Sadly, it is nothing short of demonic, and is no saving gospel at all. Pingback: BSSM – soaking, declaring and spinning into delusion. Interesting because we are to take the “self” out of it. It seems that Bethel Leaders are becoming full of self worth and self importance and many other self based tendencies. The Trinity (Dad, Jesus and Spirit) are to be Our focus.